I'm jumping aboard the Happy Hour train and letting you all know what's keeping me chipper lately, check out Bambi and Otin when you're done! ~ I love seeing my kid tickled to death 'cos she gets to ride in a Limo for her friends birthday! ~ I'm working on a really heartwarming project for my Mum and it's making me happy to know that she will freakin' adore it when she sees it! I just wish I could give it to her personally but hey that's just selfish. ~My Shih Tzu's make me happy, they're soft and sweet and follow me everywhere. if I could take them to the office everyday I would, I talk to them like they're my babies and it makes me happy. ~ Really cool purses make me happy, I love to get dressed up and have a handbag that compliments my outfit. Shoes do the same thing but it's been a while since I purchased some doozies... must shop online more. ~ My 5 year olds nostrils make me so happy I could squeal!!! They are like little upside down triangles and I have never seen anything like them, they are totally unique and she can work them baby, her face is wonderfully expressive and it all centers around those adorable nostrils!!!!! ~ The pink bubbly vodka drink that Sara had at blog camp makes me happy, and I'm totally happy that they sell it here in S. GA... who would have thunk it. It makes me giggle that it looks like it should be sold at Ricks Toybox or Xmart or somewhere... hee hee. 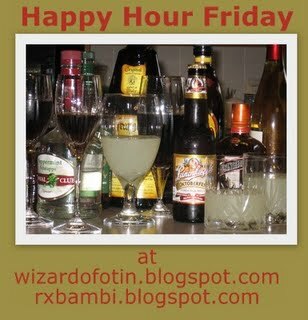 ~Happy Hour Friday makes me Happy!!! The pink bubble vodka drink sounds fabulous!! What a great trip to blog camp!! I LOVE this happy hour Friday thing!!! What an awesome idea and a great way to start the weekend! Any frothy drink with vodka is ok by me!